I wouldn’t go to WDW or Disneyland without using Lines and Touring Plans. At first the idea of having a more structured trip wasn’t appealing to me after going so many times, but now it isn’t all the bad. This app and website is a must have for any trip! 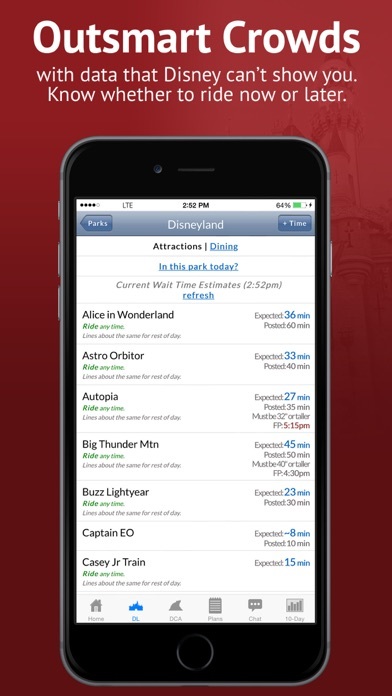 This app provides many ways to learn the tips and tricks to have a fantastic trip to Disney! Just connecting with others on chat provides enormous insight that is invaluable and can’t be found anywhere else. Thank you, Liners! Always accurate with Disney crowd levels. Wouldn’t plan our park days without Touring Plans! 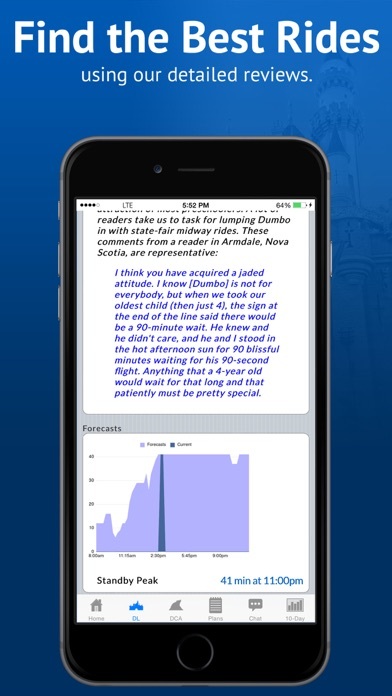 The plans, optimizing, and wait times are kind of like the weather forecast; they are wrong most of the time but accurate often enough to not be completely ignored. I’m not sure how they estimate their wait times but I think a 7 year old that frequents Disney could do a better job. Very helpful for our first day but missing a couple key features that made it difficult to use our second day: (1) DL and DCA use separate plans. 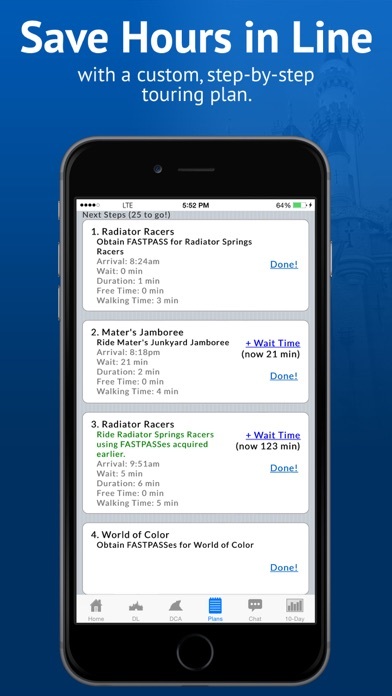 If you have a park hopper ticket and don’t mind walking back and forth, the app doesn’t seem to know how to optimize your day. (2) There doesn’t appear to be a way to constrain ride times. For example we wanted to do Grizzly River Run later in the day with a Fast Pass when it was warmer but the Optimize step would always put it early in the morning. This had a ripple effect that led to us to largely ignore the plan. Also, since we always want to do more than we have time and energy for, it would be helpful to be able to tag each item with a level of importance to us. Also, the Optimize step was too risky. We nearly missed the end of the 15 minute Fast Pass grace period multiple times because of unexpected delays. It would be helpful to tell it how much risk we are willing to take. Finally, the app is too slow. Many times we refrained from using it because of the sluggishness. This was especially the case for non essential functions like logging wait time. This may help explain why its wait times were often so far off: Almost nobody is contributing wait times because it’s so sluggish. I renewed my subscription because we have used touring plans many times in the past. This year the app was not accurate at all with its wait times and fast pass return times. I mean not even in the ballpark. Definitely felt like a waste of money this time around. Toy story mania isn’t open! How can you know the post wait times?! This app lies. 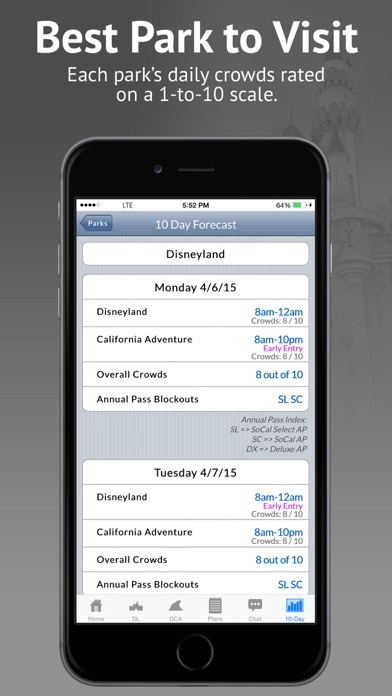 This app is great for while you're IN the park, but it's even better for when you're NOT in the park. Let me explain. 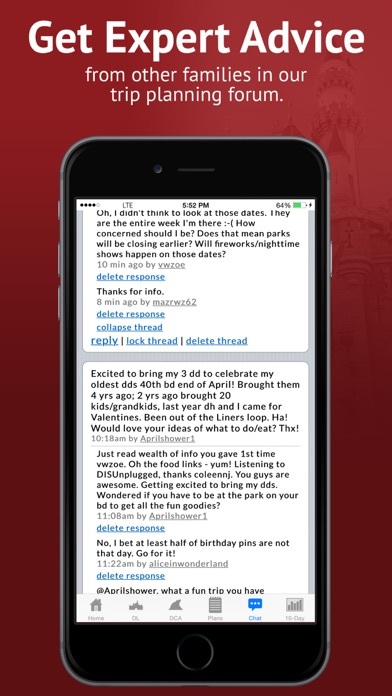 The chat room, close in feel to "lounges" of other unofficial Disneyland apps, is ripe with quality content conversation. Whether you're planning for your trip, wondering which walking shoes are recommended by DL veterans, or just want to experience more DL discussion to soothe your post vacation blues hangover, it's a great place to check and participate in. As for the service it provides while you're in the park, superior to other apps in that it offers advice along with the wait times. A veteran may see that Indiana Jones is 35 minutes and realize that's a jackpot opportunity to go into stand-by if you don't have a fast pass, but noobs and even anxious vets will appreciate the advice that comes with it in their "go now" or "go anytime, wait time won't change" FYIs. I also highly recommend the companion book, The Unofficial Guide to Disneyland, as it's the most entertaining literature on the park I've found in my seven years as an annual passholder. Thorough information on the parks and everything in it, comedic albeit dry commentary. 5/5 stars. I’d never Disney without it! No matter which parks WDW or DL. Just makes it more relaxing for me.